Choosing insurance for your contractor business can feel complicated and confusing. There is no one-size-fits-all policy that will neatly cover contractors across the industry just as no two contractor businesses are exactly alike. The kinds of policies and coverages available to contractors is almost as vast and varied as the jobs they perform and the types of business they run. But choosing the right insurance to protect your construction business doesn’t have to feel dizzying. Here are a few questions to ask yourself, about your specific business and it’s unique needs. This list of questions will help you figure out which coverages are necessary to protect your construction business and which ones are not for you. Is Your Construction Business a One Man Show? Factors like whether or not you have employees, as well as the way your business is structured, will have an impact on your particular insurance needs. Are you the sole employee working for your business: managing projects, procuring supplies, and completing the labor? Odds are, you have other skilled workers on the payroll, each performing their unique roll in order to keep your business moving forward and prospering. Think about everything they do for your business. What if one of them were to be hurt or – worse – fatally injured on the job? If one of your faithful employees was hospitalized after falling off a ladder or laid up for weeks with a broken ankle, would you be able to cover their medical bills and lost wages? That’s where workers’ comp coverage comes in. Not only does it assure that you are doing the morally responsible thing by taking care of an employee that got hurt on the job site or in your place of business, but you’re also protecting yourself from the possibility that your injured employee decides to sue you after the fact. Furthermore, in many states, workers’ comp is required by law. In those instances, skipping workers’ comp could not only result in a lawsuit, but also likely in serious fines and possible jail time. If you are the sole proprietor of your contractor business, you are personally responsible for your business debts. That means that if someone trips and falls on your job site, brings a lawsuit and is awarded a settlement, you are personally held responsible for the costs. And if your business can’t afford to pay, your personal assets could be at risk. So, while insurance is always a good idea for those who don’t want to use their hard won business assets in time of need, a general liability policy is an absolute necessity for sole proprietors who want to protect their personal assets. Who’s Driving Your Work Vehicles?? Whether you have a vehicle designated for business use or a personal automobile that’s being used for business purposes, commercial auto insurance is a must for most construction businesses. While a personal auto insurance policy is important to protect you from paying out in the event of a non-work time accident in your personal, it will likely do you no good if the accident takes place when you’re driving the same vehicle for work purposes. That’s where a commercial auto insurance policy takes over. Personal auto insurance is intended to cover your personal vehicles for personal use. But when your own truck, SUV, or van does double-duty as a work vehicle, you’re generally going to need commercial auto coverage to fully protect it from accidents on the road. Do You Provide a Vehicle for Employees to Drive? Do you ever toss the keys to one of your employees as they head out the door to pick up lunch for the crew? Or ask one of your employees to run your truck over to another job site to pick up equipment you need to move forward with a project? As soon as that employee gets in your car, his personal auto insurance, as well as yours, may leave a coverage gap. Not to worry – a commercial auto insurance policy will have them, and you, covered. As long as your vehicle is being used for work-related purposes, commercial auto insurance generally protects your vehicle from road hazards, whether it’s driven by you or an employee. Contractors up and down California have a big job ahead of them as they rebuild after the devastating fires that struck the state in fall and winter. How Much Cash Do You Have on Hand?? Should you choose to forego insurance for your contractor business and the unexpected happens, are you able and willing to part with your hard-earned business assets? Will your contractor business survive payout for an accident or lawsuit? Imagine someone is injured as a result of your business activities. Now you’re facing a big bill: medical payments, lost wages, maybe even a lawsuit. Would your business still be able to move forward and thrive following a large financial payout? Rather than chancing a sizable loss in your business – or personal – assets, protect your business with coverage that will step in during your time of need. Is it worth the risk to skip insurance? Hopefully, no bad luck will befall your business and you will never have to use your insurance coverage. But, in all likelihood, there will be one or more times during the life of your business that some sort of accident will befall you, an employee, or a vehicle. 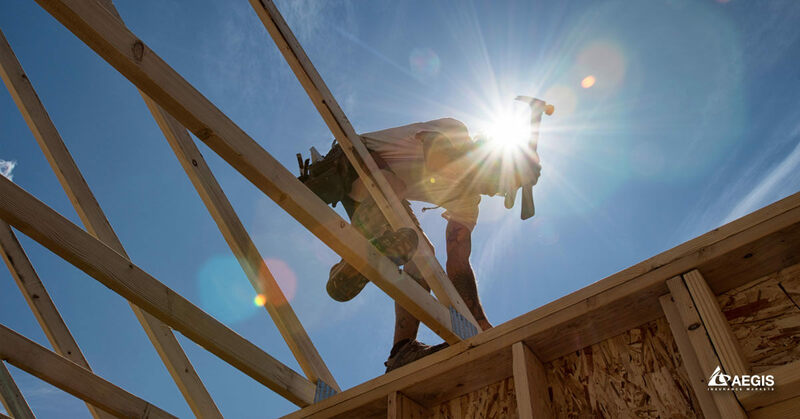 Approximately 4 out of 10 small businesses are likely to experience a property or general liability claim over the next 10 years, and in the construction industry, your risk is even higher. Your insurance coverage will be there to help you pay for costs, protecting your assets and assuring the survival of your business. But protecting your business doesn’t have to break the bank. Aegis Insurance Markets has a long history working with contractors and will work to find the best combination of coverages to suit your unique business needs. Assure that your hard won assets are protected from hazards of the workplace and the road with a coverage package designed specifically for your business.